Whether most of you want to believe it or not, live wallpapers are still a thing, and there are plenty of people still using them everyday. The newest live wallpaper app to catch our attention is Fracta, from the maker of hit LWP apps such as Light Grid, Paperland, and Photile. 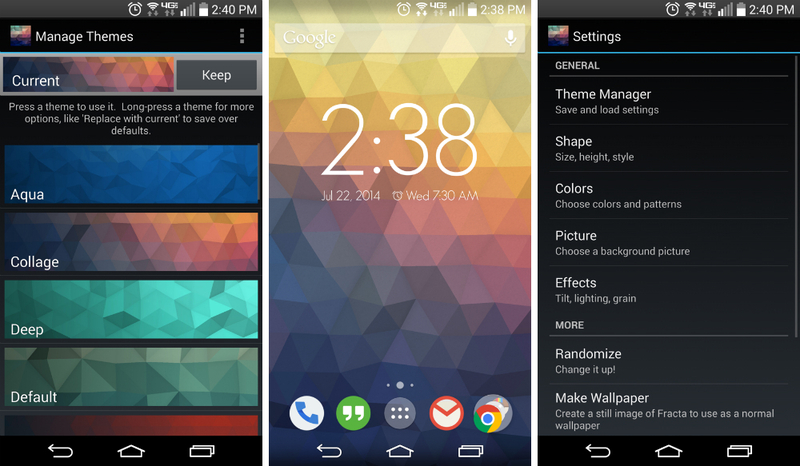 This developer has been pumping out enjoyable live wallpaper apps for a few years now, with Fracta raising the bar yet again. If you will recall a while back, Apple introduced a LWP-type feature for iOS, naming it the Parallax Effect. With Parallax enabled, users could tilt their devices, revealing other little parts of a wallpaper on their home screen. Fracta is basically the same thing, except with this app, it is much more customizable than anything an iOS user can do, but also comes with a ton of awesome preinstalled themes for you to choose from. The video below isn’t the best quality, but it does a decent job at conveying the tilt effect, which is the key seller for this live wallpaper. If you like what you see, try out the free version on Google Play, then bump up to the Pro version for $1.99 if you are feeling creative.